This stuff is great for making long lasting shock cords for almost any rocket. 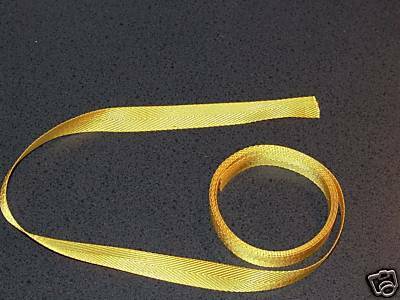 Its 100% Nylon 5/8'' wide YELLOW in color, and has a tensile strength of 1000lb. We have used this stuff to make shock cords for anything up to a High ''I'' impulse. Simply epoxy one end of the strap to your motor mount, run it through the front centering ring of your kit and loop the end off to attach your rubber shock cord to. Its very strong and flame resistant. We Can Accommodate Most Lengths If You Require Something Longer, Just Email And Ask Us Its Still .50 Cents a Foot.